Spoto’s Oyster Bar never disappoints me. With how pleased I leave every time, I really should start going more often. Located in PGA Commons, Spoto’s has a great, lively atmosphere and offers outdoor seating. The decor is perfect for an oyster joint and there is always a crowd at the bar. The back room has a much more mellow feel, but is a great spot to grab a drink while you wait for your table. The bartenders are always fantastic with great personality. Same goes for the servers. I feel like if you’re in the mood for a good time with friends – this is the place, because everyone seems to be on board with it being a great evening for all. True to its name, at the top of the menu is the “On the Half Shell” section with an array of oyster and shellfish items. You can order Bluepoint Oysters, Naked Cowboy Oysters, Asian Oysters with sesame and caviar, Bluepoint Oysters Martinis with vodka, Raw Bar Platters and even a Shellfish Tower of oysters, clams, shrimp and lump crab. 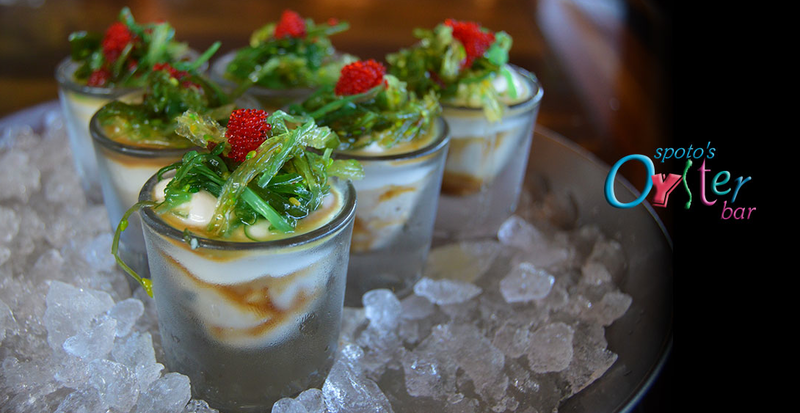 We went with the Oyster Shooter with oyster, cocktail sauce, tabasco, horseradish – and vodka (optional). You can order individually or by the half dozen. They are basically a shot glass with an oyster and the various condiments, topped with a little vodka. I’m not a huge oyster person, so I was slightly terrified and this seemed like a nice beginner’s way to partake. They were actually pretty good and I really liked their cocktail sauce. They started us out with some bread and an olive oil and herb dip. They have a nice wine selection by the glass which proved to be popular. I went with the Shrimp Scampi in a white wine and garlic sauce over angel hair pasta (they also serve their scampi in a red sauce if preferred). I always have trouble ordering scampi, because it’s something I can make at home, but I love Spoto’s scampi and it sounded perfect. They offer a nice portion of shrimp and I love the lightness of their pasta. It almost feels fluffy. Their presentation could use a little work, but it’s so yummy I don’t care. Other meals around the table included the Lobster Risotto topped with asiago cheese and tomatoes. It’s a smaller portion, but beautifully plated. The Pan Seared Sea Scallops crusted in herbs and panko looked amazing and were served with rice and asparagus. The Jambalaya Fettucini with chicken, andouille sausage and shrimp looked delicious and may be my order next visit. For non-seafood lovers they have a nice selection of “turf” including Stuffed Chicken Florentine, an Apricot Glazed Pork Chop, Filet Mignon and Top Sirloin, among others. You can also get the jambalaya without shrimp.